This is an entirely new setting of the Bible, published to coincide with the 400th anniversary of the King James Version but intended to become a staple of the Cambridge list for many years to come as a new and distinctive format. This particular edition is the first new Cambridge KJV reference Bible for over half a century and has been carefully designed for the modern era to meet an increasing demand for a more accessible format and comfortable reading size. It is typeset in Lexicon No.1, a digital font designed for easy reading and with many similar characteristics to traditional hot-metal Bible typefaces, thus marrying the best of the old and the new. The print is black-letter throughout and the text is presented in paragraph (rather than traditional chapter and verse) style and in a single-column format. The notes and cross-references have been relocated to the outer margin, leaving the text relatively free and unencumbered. The Bible includes 15 color maps and – instead of a conventional a concordance and dictionary – a Reader's Companion which offers the key elements of those features in one place. It is printed on India paper with art-gilt edges and is bound with two ribbons in black goatskin leather, edge-lined for extra suppleness and flexibility. Whenever I hear a Cambridge Bible spoken of, it is in superlative terms, as well they should be. This is the 424th year that Cambridge has been producing bibles and they have quite perfected the craft. 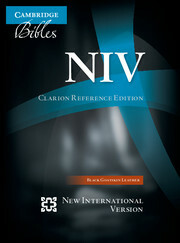 Whatever your taste in Bibles, Cambridge doubtlessly has something to offer including all the major translations: NIV 1984, ESV, NKJV, NASB, NLT, NRSV, and a massive KJV Selection. In today’s review, we will look at the Clarion Reference Edition, what I think could well be the ultimate reader’s edition. 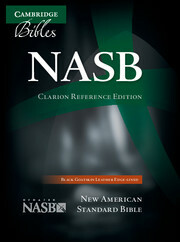 Translation Choice: The Clarion Reference is available in NASB, ESV, NKJV, and KJV. I was very torn on the choice this time. NASB is my preferred for study and lesson preparation, I thoroughly love the ESV as much as NASB, and my pastor teaches from the New King James, but the King James is what I grew up on. There is a certain regal beauty to it and, some times, it actually feels more holy to read I’m sure that is just me though.. This time around I chose the KJV, mostly for sentimental reasons: I learned to love the Bible and my grandmother’s table and since we always read KJV together, I opted for what is most familiar to me for devotional reading. 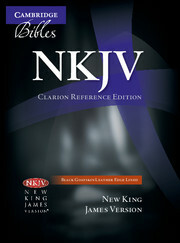 My colleague at the Bible Buying Guide chose the NKJV and loves it with equal passion. I find it interesting that Clarion is only offered in the four Formal Equivalence Translations. I would love to speculate as to why but I will get myself in trouble. Suffice it to say since the Clarion is among the best in Reader’s Editions, you want the best in translation, which, I think, is Formal Equivalence. Irrespective of your translation choice, you should find the layout to be the same and thoroughly enjoyable. Cover Material Cambridge is the godfather of the Premium Bible Market and their cover choices are worthy of that status. You can choose Calf-split Leather, Calfskin, or Goatskin. I opted for the goatskin it seems to be the most durable and, let’s be honest here, it just feels fantastic Hint: the cover is one of the things that causes Cambridge Bibles to be spoken of in such superlative terms paper is the other.. There is a subtle coarseness to the goatskin cover the grain can definitely be felt but it is not as noticeable as on other Bibles that I have held My genuine leather NASB Hebrew Greek Study Bible from AMG has a much more pronounced texture on the cover than this Clarion. If you are like me, you will probably find yourself touching this Bible throughout the day. This may sound a little cliché but the feeling of holding this Bible reminds me of the first time I held my wife’s hand, there is something that keeps drawing my hand back to it. The goatskin should stay quite supple over the life of your Bible. As you use it, the naturally occurring oils on your hand will get massaged into the cover and will keep the material from becoming dry and damaged. The cover is quite limp. Curiously though, it does not seem quite as limp as the cover on my Calfskin NASB Side Column Reference Bible, which is printed and bound in China. I do not personally find that to be a problem, as I like a little stiffer feel. References Clarion is a Reference Bible and there is no shortage of references, though it does come in third place, in my hierarchy of preference. The top three Reference Bibles, in order of my usage would be the Thompson Chain Reference 100,000 completed chains, Westminster Reference Bible 200,000 References and then the Clarion. When it comes to references, Clarion is by no means deficient they have adopted the KJV Reference System from Zondervan House, which easily has 75,000 references. For both the average Bible Student and the Pastor, the references are quite substantial and suitable to your study endeavors. An important note is that this is a side column reference edition. In many cases, this is actually a smarter choice because the references do not interrupt the flow of the text. Side column references, for some, may take a little getting used to, but when you make a Clarion your daily Bible you will very quickly acclimate to the layout. It reminds me a little of some of my old textbooks that separated notes out into the margins. I rather like it and since I have side column and center column reference editions I move back and forth quickly. Paper & Binding One word: Jongbloed. The famed Dutch Bindery, Royal Jongbloed considered by most to be the best bindery in the world binds Cambridge Bibles, in this case using India paper. For those who are nerdy about it like me I am going to guess at between 26 and 32 GSMs on the paper. The opacity, though, is what really makes this Bible stand out. The only Bible I have seen, to date, with more gsm is the Quentel NASB from Schuyler Bibles if memory serves, Quentel is 40gsm, which, incidentally, is also done by Jongbloed. I have heard some complaints about the paper with ghosting and the like. There is minimal ghosting but nowhere near anything that would be bothersome. As I said, previously, the opacity is what makes this a standout product. Would I like a more opaque paper, maybe, but that simply is not practical. Depending upon what you use for your Bible marking, there will, possibly, be some bleed through as the paper is not as thick as others. That being said, I don’t know that a Clarion would be the Bible that I would write in. That is not to say that this isn’t adequate for writing but that writing is not the intended purpose for this Bible this is a reader’s edition. Text Layout What makes this a “Reader’s Edition” The text layout is 8.75-point font in Lexicon Number 1. It is presented in single column paragraph format. This is phenomenal at your desk for reading but totally impractical for the pulpit I would recommend Pitt Minion, Concord Reference, or Cameo Reference for the pulpit. For regular, day-to-day reading though, Clarion cannot be beat. Circling back for a second, the single column paragraph format is what makes this a “Reader’s Edition.” It is laid out more like a novel, although unlike other reader’s editions this one still has the chapter and verse demarcations. 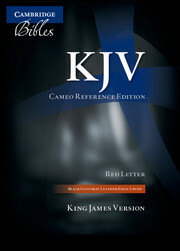 The layout is a refreshing change from the typical double column and verse-by-verse formats that most Bibles come in. Readers Companion The Reader’s Companion is 144 pages and includes 7 major features. The most significant proper names. Names include people, places, tribes, etc., along with a short description or explanation, and a list of the most prominent verses. Definitions for words that have changed meaning. Also includes references to verses. Background of life including: animal and plant-life, and information about people including customs, occupations, and artifacts. 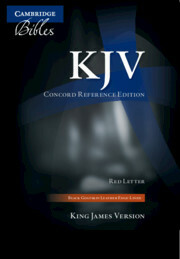 Also includes references to prominent verses on the topics covered. Brief information on social, legal, ethical, and religious concepts in the Bible with a list of references. A short introduction to every book in the Bible. Information on literary forms, original languages, and related non-biblical ancient texts. History and features of the KJV Authorized Version and other related Bible translations. Key words with references to verses. These are especially useful for locating Biblical quotations. Final Thoughts: Cambridge Bibles really are among the best you can get. Most of the pastors that I know carry Cambridge into the pulpit and, from what I am seeing, with good reason. 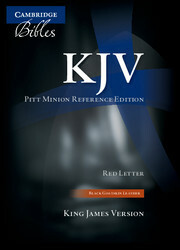 A Cambridge Bible is an investment these are not low price Bibles, a lifetime investment that will have eternal returns. If you are thinking Cambridge but cannot make up your mind, I encourage you to visit your local Christian Bookstore or ask your pastor to see theirs. You will love every minute of use.